Unaccountably ignored when it was finally released, this is actually a first-rate account of the later history of Gladys Knight & the Pips. Dating from a good half-decade past their chart heyday, Live at the Roxy captures the quartet in a spirited if somewhat slick mode -- "Grateful" opens the show (after an intro of the Charlie Chaplin co-authored standard "Smile") on a smooth pop/soul note, but when they slide into "Taste of Bitter Love" you know why audiences were still packing to see them in 1980, and why you're buying this CD. The soulful vocal acrobatics, the soaring harmonies, and the energy spikes can fill a room even off the CD, and at the actual show it must've been awesome. From there on Knight and company never let up, gliding effortlessly through bluesy R&B and gospel-tinged sounds, in a recording that's as beautifully balanced technically as it is energetic. Knight sometimes sounds a little strained, as the set of shows from which this CD was drawn came from the midst of a massive tour -- but as compensation for those moments, she gets a little bit of help on "Landlord" from Stevie Wonder and Dionne Warwick. 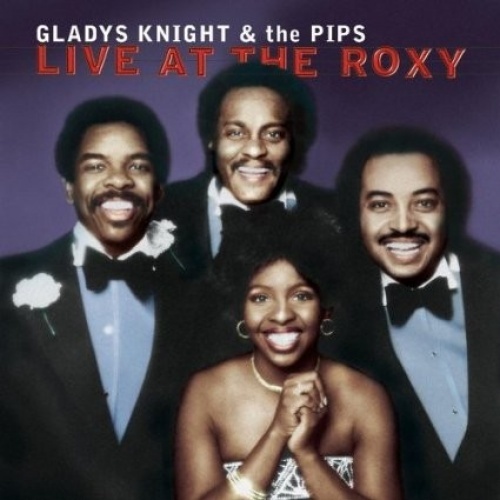 This may have been past their high charting days, but Gladys Knight & the Pips were still worth hearing in 1980, and this CD is an essential coda to any collection of their hits. As to why it took 18 years to show up is something you'll have to ask Sony Music.